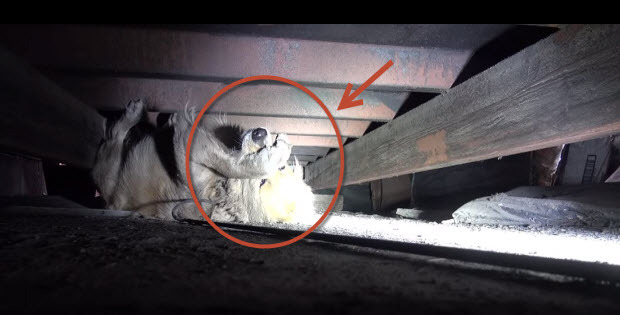 Amazing video of a Golden Retriever rescue. Scared dog acting like a little-scared child. When rescuers came to get this pooch, they didn’t expect to see the reaction that they saw and witness the most touching and “aww” moment that they have ever. This poor golden retriever dog got so scared and having nowhere to run he was just laying there covering his face with paws. It was obvious to everyone that he is terrified and rescuers wanted to comfort him. So they petted him and comforted this poor scared “kiddo”. And the message that this pooch got “do not be scared we are here for you”. It seemed that he got the message loud and clear because he did become more calm, more trusting and more comfortable as if he really got the message. As if he understood that from this moment on everything will be all right. You need to see this for yourself to feel and understand how touched the rescuers were at that moment. A Simple Cry For Help Unveiled A Pitiful Sight That Will Haunt Your Dreams! Not For The Faint Heart Or Stomach! THE LION IS READY TO JUMP! AND SOME PEOPLE ARE JUST CLUELESS! Golden retrievers are wonderful dogs.